There are at least 347 million guns in America. No matter your opinion of them, it is highly likely that you will encounter one at least sometime during your life. This is what everyone needs to know in order to be safe around guns. This is not a political argument. This is not an argument for guns or against guns. It is a practical guide to gun safety for people living in a country where there’s more of them than there are of us. Why can’t you just leave your gun safety at not touching one if you see one? Well, denial isn’t really a practical resolution to problems, is it? In the 12-month period following the Sandy Hook Elementary shooting, 100 children aged 14 and under were killed in accidental shootings; 80 more children than were killed in the tragedy itself. And all of those deaths are completely preventable. Yes, that could be achieved by waving a magic wand and ridding the earth of guns, but much more realistic is educating yourself and your loved ones about gun safety, thereby ensuring that you know how to avoid shooting yourself or someone else should you or they encounter one. To create this article, I needed an expert in firearms. And, who knows more about them than a special forces soldier who served in Iraq and Afghanistan? And, who knows more about gun safety than someone who keeps guns in a house alongside two young girls? That person is Matthew Griffin, a former captain in the Army Rangers who is now providing economic opportunity and education for women in war zones. Don’t point the gun at anything you don’t want to get shot. Don’t put your finger on the trigger. Better yet: don’t mess up either. Let’s say you’re at a friend’s house and they pull out a gun to show off. It might be theirs, it might be their parents; that doesn’t matter. This happens. If you know what to do, you can politely ask to see the gun, then ensure that it is safely unloaded, thereby ensuring both your safety and that of everyone else nearby. If you can leave a gun alone, leave it alone, but the above scenario and ones like it are all too common. Knowing how to make a gun safe is simply a practical skill anyone living in a country with more guns than people needs to know. Just like you know how to change the tire on your car, how to use a fire extinguisher and what to do in an earthquake, you need to know what to do with a loaded gun. The Bullet: Made of four basic parts. The primer starts the ignition process of the gunpowder. The casing holds the gunpowder. The gunpowder is a propellant used to create force. The projectile is the object moved by that force. When the primer is struck, the gunpowder ignites and forces the projectile of of the casing and down the barrel of the gun. That projectile is pushed out of the barrel of the gun and works to poke holes in stuff at high velocity. The point of this article is to stop those holes from being created unintentionally. The Weapon: Most guns have a safety, a trigger, a breach or chamber and a barrel. The safety is a mechanical device that prevents the gun from being fired. 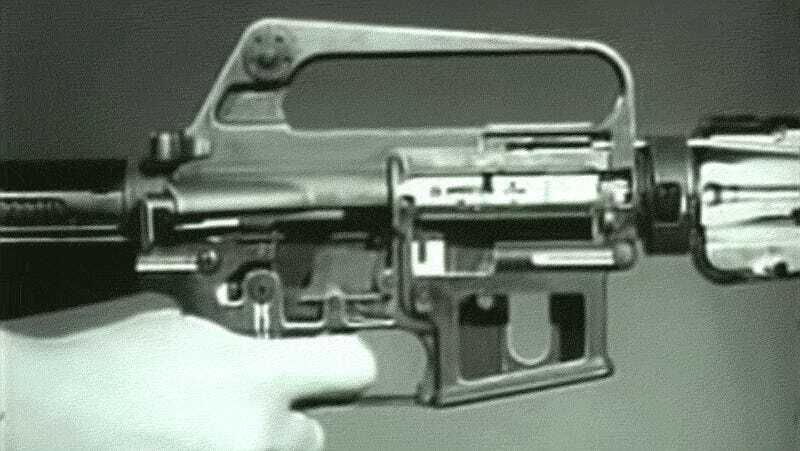 As a mechanical device, it’s subject to failure like any other and should not be relied upon over those two gun safety rules above. Pull the trigger and the gun goes boom. The breach/chamber is where the bullet is held before and while it’s fired. The barrel is the cylinder that contains the explosive force of the gunpowder, propelling the projectile down to the muzzle, the hole in the business end of the gun. A gun is safe when you can visually confirm that there is not a bullet or casing in the breach/chamber of the gun. To make a gun safe, you unload the gun, open the action to identify the breach and ensure you can visually identify there is not a bullet or casing in the barrel. This is what we’re going to show you how to do. These are the types of guns you will mostly likely encounter anywhere in the world, and how to make them safe, with annotations from Griff. Think we missed anything? Let us know. Point the weapon in a safe direction. A weapon is safe when you can visually inspect that the chamber is empty.